The RetailMeNot Coupons app features a huge variety of coupons, deals and special offers to the stores and restaurants you love most. It’s never been easier to snag a free shipping code or to score an in-store coupon directly from your phone. Our mobile coupons app boasts the biggest arsenal of top coupon categories for use on the go or to save and use later. As the #1 coupon site in the world, our promo codes and deals deliver the best savings on clothes, electronics, food, entertainment and more! What are you waiting for? Get our free coupons app today. 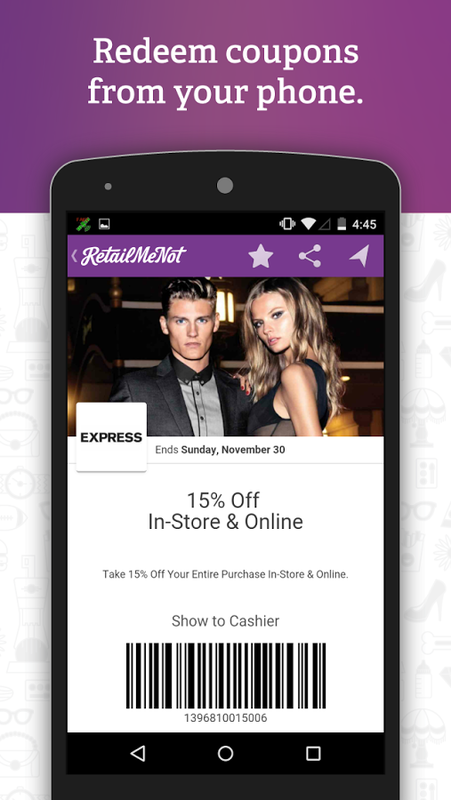 The RetailMeNot Coupons app makes it easy to save when you want, where you want at all your favorite stores. Search from hundreds of thousands of online and in-store coupons—whether you’re on the go or in the comfort of your home. Browse the RetailMeNot Top Coupons, Popular Stores, Categories and Today’s Hot Deals. Save online with simple tap-to-use code redemption for a seamless mobile experience. Save in the store by presenting the coupon directly from your phone to your cashier. Not ready to make a purchase yet? It’s easy to save your coupons for later. • Choose from hundreds of thousands of coupons. • Browse using RetailMeNot’s Top Coupons, Popular Stores, Categories and Today’s Hot Deals. • Redeem online coupon codes with a simple tap-to-use feature for seamless on-the-go savings. • Redeem in-store coupons at checkout directly from your phone.